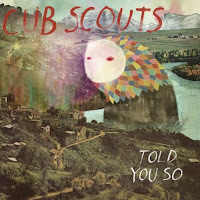 Cub Scouts have just released their third single "Told You So", the title track of their debut EP. It really is classic Cub Scouts; it may not be as poppy or frantic as "Evie" or "Do You Hear", but one thing is for sure: these guys know how to make a catchy melody. What I love the most are the deeply layered sounds on which the frontman Tim Nelson rests his dreamy vocals upon. A common factor in all three Cub Scout singles.